The discussion opened with the moderator asking Singh about the preliminary assumptions he works with while advising clients about investments and financial planning.According to Singh, the most important aspect is to look at the investor's profile. That is where one wants to invest, how much time one has to stay invested, what are the Goals and requirements of the individual etc. Based on each parameter one has to assess the individual and then look at various products one should invest in. Then one has to do the asset allocation. According to Singh, mutual fund does not mean only Equity investment but it is a vehicle to invest in various assets that suits one's needs and to achieve one's financial Goals. On the question of diversification while investing through the mutual fund route, Bhardwaj of The Capital Investment Advisory Services said that the first point to remember while investing is to beat inflation and equities are the best asset class to invest in which can help investors to beat inflation. According to him, 30% of Equity allocation is a must for every investors, even if it's for a retired person. If a retired person has 70% in Debt and 30% in Equity, it has been seen that even if he withdraws 8-9% of the corpus annually (divided into equal monthly withdrawals), his corpus will not exhaust, he said. “Young people can invest up to 70%, or even 90% in equities, provided they have an investing time horizon of minimum five to seven years, and not maximum of 5-7 years,“ he said.And a person in his middle ages, can have 50-50 allocation into Debt and Equity, he said. On the question of which mutual funds to invest in, Chilana said that at first investor should look at diversified funds.And then if one is an informed investor, one could go for sector funds like pharma funds, IT funds etc. Also one should be aware that the asset allocation should be based on the age of the investor. “If one is young, he could go for 70-80% into equities while if one is in his middle ages, he could settle for 50-50 allocation in Debt and Equity, and after 60 one could go for 70-30 allocation for Debt and Equity,“ Chilana said.According to Singh, to select a fund, first one should look at the consistency of return of the fund, the next is the age of the fund. While answering a question on how an investor should behave when a fund manager is taking undue risks in Debt funds, Singh said that the problem is that often fund houses chase higher AUMs, which in turn pushes the fund managers to try to give higher returns which again in turn force the fund managers to invest in lowly rated papers in expectations of higher returns.“In such situations investors need to be very vigilant and there advisors also play very crucial role,“ Singh said. On the question of how retail investors should behave in the stock market when one could see that foreign investor are the main drivers, Singh said that although the trend in the past several years was that foreign investors were the dominant investors, in 2015, the wheel has turned in favou of domestic investors who have pumped in more money into equities compared to foreign investors. 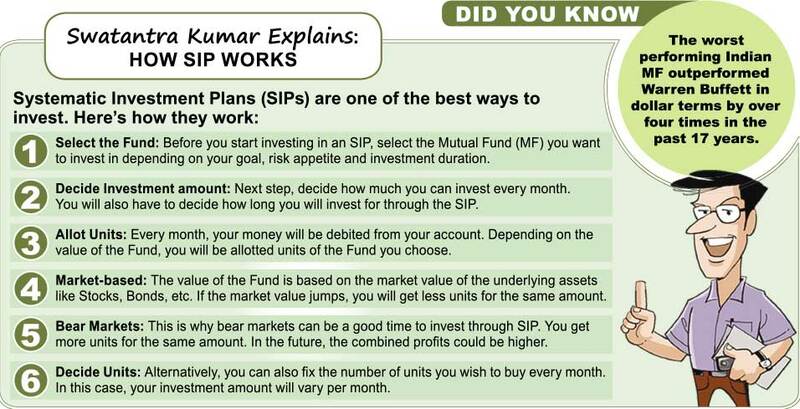 One of the investors at the discussion asked that in the current market if foreign funds are putting less money while investors investing through the SIP route are putting in more money, is it leading to a bubble like situation which could burst one day. According to Bhardwaj the reason that FIIs are pulling out money is not that they don't like India, but because of factors external to India. For example there was problem in China and BRICS block as a whole was downgraded. But he assured that a lot of foreign money was waiting on the side lines and as and when global situation improves, they will pump in money into India. “Historically it has been seen that wheneve FIIs pulled money out of India, and whoever invested at that time made lot of money (in the next few years),“ he said.“It's a good signal that FIIs are pulling out money, which means they are giving you the opportunity to invest,“ he said.